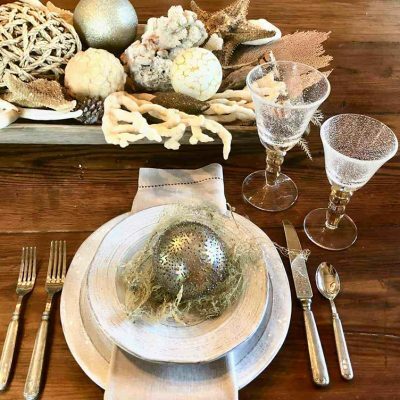 For the past seven years, Artful Home has had a successful partnership with Susan Kinzig and Caryn Kinzig, sisters-in-law who design and create glamorous, artistic lamps. Their business spans cross-country: Susan’s studio in California crafts the blown glass bases for their beautiful lamps, while Caryn’s studio in Pennsylvania creates the stunning shades. At Artful Home, we pride ourselves on the strong partnerships we build with artists. Due to the trust and loyalty these partnerships garner, artists tend to refer fellow artists to work with us. Susan and Caryn have graciously referred many artists to team up with us over the years, and the most recent referral was Kevin O’Brien. Kevin O’Brien handcrafts beautiful fabrics that can’t be matched by mass-produced items. His studio hand paints, screen prints, and use a technique called panne, where the velvet pile is flattened in one direction creating a smooth, rich looking sheen. 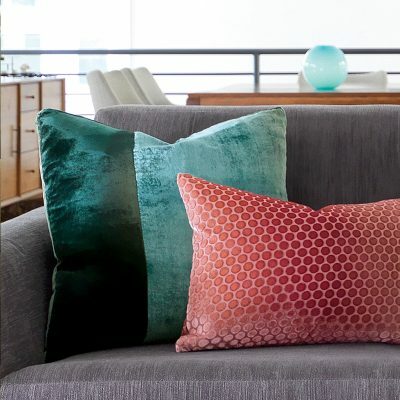 Kevin’s team use these techniques to create the unique textures, colors, and patterns that adorn his decorative pillows and luxurious scarves. 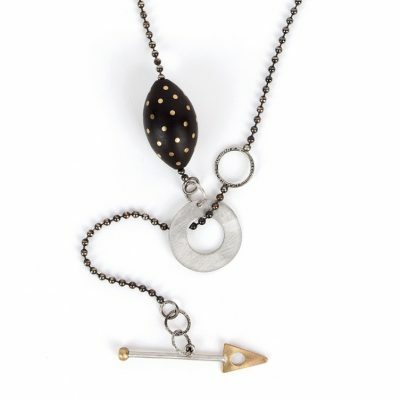 Caryn Kinzig has worked with Kevin O’Brien for about two years. Caryn and Susan met Kevin through a mutual customer who mentioned Kevin’s work to them at the High Point Market, a home furnishings trade show in North Carolina. Intrigued, they went to meet him at the show, and were immediately inspired by his hand-painted fabrics. 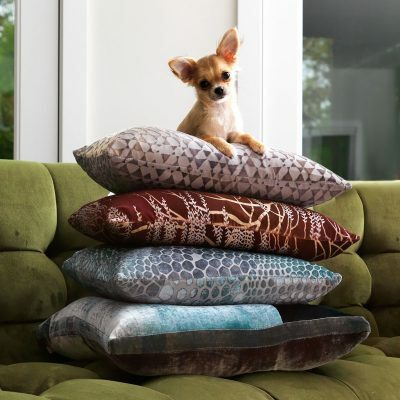 Because Kevin and Caryn both have studios in Philadelphia, they are able to work together closely to select fabrics for Caryn’s unique lampshade designs. Susan and Caryn introduced us to Kevin O’Brien at the High Point Market in October, 2017. In fact, the Liliana Table Lamp was our introduction to Kevin O’Brien’s line of work. 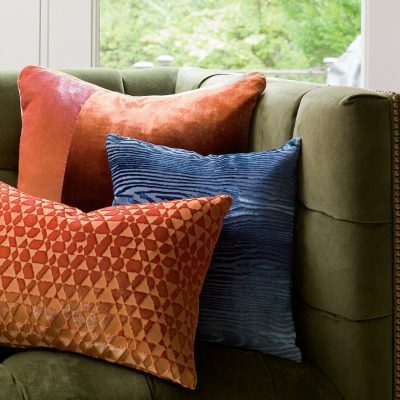 Pillows by Kevin O’Brien: Triangles Velvet Pillow, Large Woodgrain Velvet Pillow, and Large Colorblock Velvet Pillow. Recently, Susan and Caryn opened the opportunity for us to sell an exclusive line of lamps from their collaboration with Kevin O’Brien. 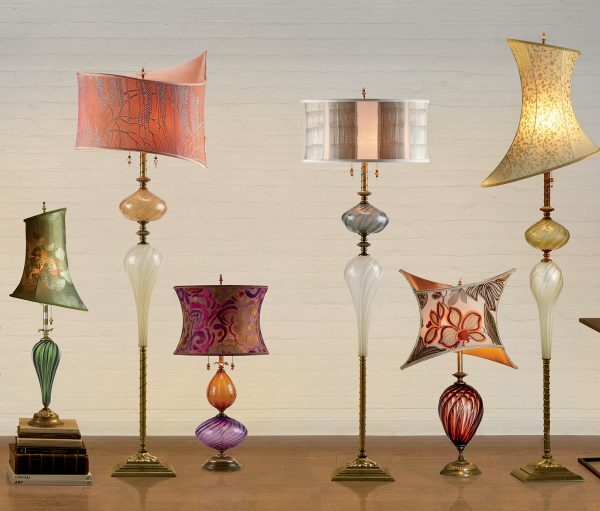 We have joined forces to create and present this unique collection of exceptional lamps available only at Artful Home. Our very first lamps from this collaboration launched this year in our Winter Collection, including three table lamps and two floor lamps. We also offer a selection of other Kinzig lamps featuring Kevin O’Brien’s hand-painted fabric, including the Matilda, Grayson, and Sacha. 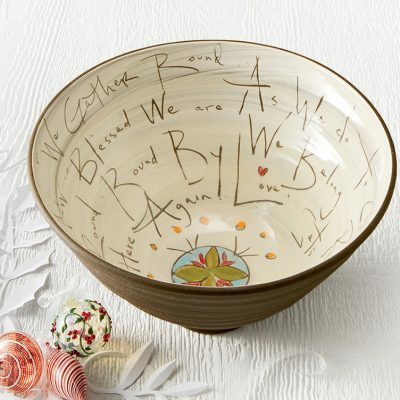 These designs are not exclusive to us, but are still greatly loved by our customers. Shades covered with Kevin O’Brien’s hand-painted fabrics. It is such a privilege to collaborate with artists on exclusive designs. 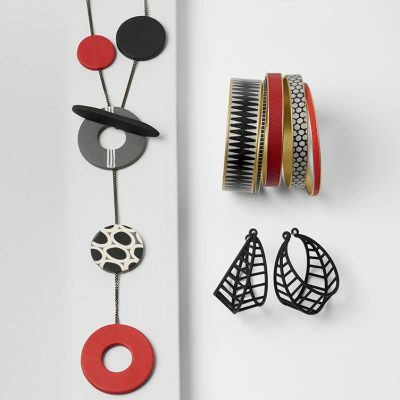 For this particular collection, our merchants worked closely with all three artists to incorporate new color combinations and styles that we think our customers will love. While working with Susan, Caryn, and Kevin on our lamp collection, it felt like a natural continuation to include Kevin’s luxury decorative pillows and scarves in our Winter Collection. Our merchants worked with Kevin’s team to select color groupings that worked well together, from greens, blues, and silver grays to pinks, reds, and golds. 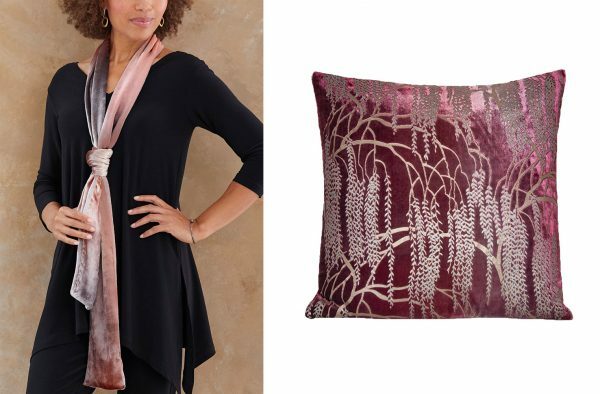 These also coordinate well with the Kinzig lamps that feature Kevin O’Brien fabric shades. 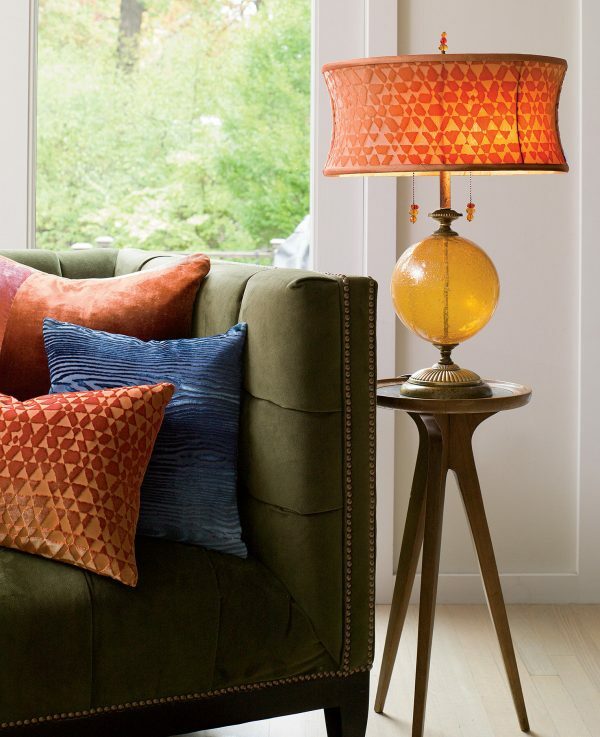 See more of Susan Kinzig and Caryn Kinzig’s outstanding lamps and Kevin O’Brien’s luxurious pillows at artfulhome.com.